This man is a SCHOOL PRINCIPAL. And what is he going to do exactly when he finds Archie? Beat him with that 2x4? For real? Of course he is. 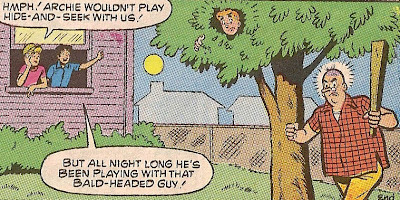 Because it's Riverdale, and Archie knows that if he doesn't hide in a tree all night, Mr Weatherbee will find him and beat him within an inch of his life. It's also notable that those kids don't find anything odd about a furious man with a weapon stalking the streets at night looking for a frightened teenager. Par for course in ol' Riverdale.